Jan Akrosh rally orgnised in New Delhi on Sunday at Ramleela ground where the congress workers were addressed by congress president Rahul Gandhi. Rahul Gandhi reminded the failure of PM Modi’s government. He narrated the whole story of technical problem in the flight which he had aboarded. Rahul shared his feeling with the party workers. The statement is seen important in the wake of election and this shows an image of moderate Hindutva of congress. The BJP which took power in the centre during 2014 has been alleging Congress for anti-Hindu constantly. The congress, getting consecutive defeat in the elections, tried well to overcome from this allegations, and to change its image among the people, of which results were seen in Gujarat assembly election. 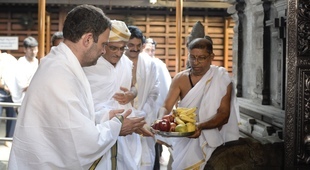 When Rahul Gandhi gave priority to visit the temples during the election campaign, the Congress’s soft Hindutva image emerged in the spotlight. Rahul Gandhi kept on claiming himself a man adheres to Hindu and he told himself a Janeu holder. Rahul Gandhi and congress leaders are continuously visiting the Mathas in Karnataka. Rahul has visited the Mathas and temples linked to Kurba, Lingayat, Vocaligga community. He can be seen worshipping and taking bless of pious Teeka on his fore head by priests. Where Rahul on the one hand has announced his commitment to go on a tough journey of Kailash Mansarovar after the plane’s narrow escape from crash; on the other hand, PM Modi who is to go for the election campaign in Karnatka on May 1st could not visit the Kedarnath temple on his scheduled programme. The door of Kedarnath temple has been opened on Sunday and PM Modi had to visit Kedarnath, but his programme was cancelled. It is noticeable that the journey to Kailash Mansarovar is understood a tough journey of Hindu religion. The congress president’s journey can be seen as big message among the Hindu communities.